The Stamina Fold-to-Fit Folding Equipment Mat (84-Inch by 36-Inch) protects your floors. Exercise equipment has become popular but when put in houses, they cause scratches and scuffs on the floors. This mat has been created in a sturdy manner to prevent any negative effects resulting from using the fitness machines. The Stamina Company is dedicated to providing quality products for the customers. This mat is designed with the best technology to ensure that you enjoy your home routines. There are different types of exercise equipment installed in homes according to preference and the living space that is available. Home gyms, spin bikes, elliptical trainers and other different machines will require a different area to comfortably fit on the mat. The fold-to-fit feature allows the user to customize the area to fit perfectly on the area. There are seven folding sections that are folded to fit different areas. The dimensions of the mat are also quite long. This allows larger equipment to be used comfortably. The Mat is made out of thick foam material. This is a design that absorbs any movement from the equipment during use. Vibration and impact can be very disturbing especially during intense workouts. If you are interested in aerobic routines, you can also purchase this mat to deal with the subsequent impact that is made with the vigorous movement. The thick material acts as a shock absorber for all these actions. All types of floors are sensitive to undue pressure. Exercise machines have been designed for stability and that may not necessarily align with the protection of the value of the floor. Even with a good carpet, you will not get good results because it will easily wear away. The carpet fibers are also likely to get stuck on the equipment and potentially cause poor operation of the moving parts. 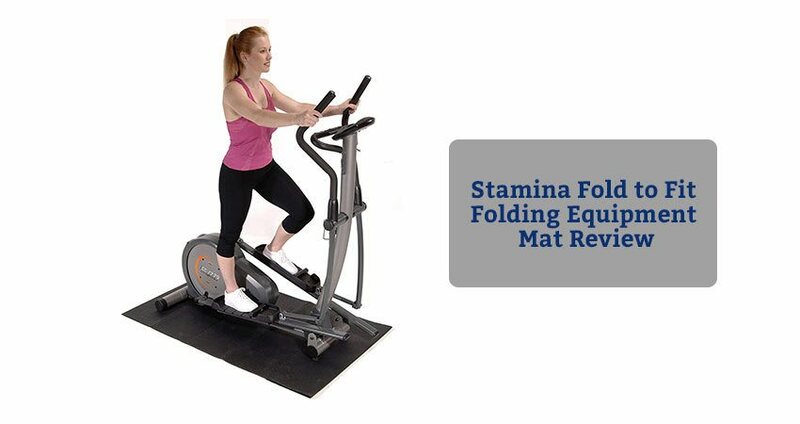 The Stamina Fold-to-Fit Folding Equipment Mat (84-Inch by 36-Inch) protects the floor from the blemishes that may occur during the routine workouts and preserves the integrity of the carpet. The surface of the mat is designed to prevent slipping of the equipment. It is textured and pebbled to enhance this function. This feature also ensures that cleaning the surface is easy and quick. It remains durable over prolonged periods even with frequent workout sessions. The mat is large and can accommodate most of the common home fitness machines. The fold-to-fit feature allows the user to customize the size to suit the set purpose. The foam material used is thick and absorbs impact during exercise. The mat is durable and resilient. The surface is textured to limit slipping and to improve cleaning tasks. Protection for the bike from stray carpet fibers. The mat has been rated highly by the users due to its versatility. It is recommended as a quality product that can be used for almost all equipment. Some users found installation hard after shipping. However, it straightens out within a very short time. This is a worthy investment in protecting all types of floors from scuffs and unnecessary blemish. If you need an ideal mat for your equipment, choose the Stamina Fold-to-Fit Folding Equipment Mat (84-Inch by 36-Inch).